Christy Rettger and her trusty steed Liam, just before bringing in a score of 68 in open competition. 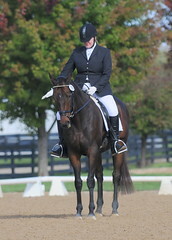 My Dressage Trainer: I’ve been taking dressage lessons with Christy Rettger (http://christyrettger.com) for several years now. The progress I’ve made is significant, and there’s more to it than just an improvement in my riding. Thanks to Christy, I’m also a better horsewoman, more adept, confident and observant. 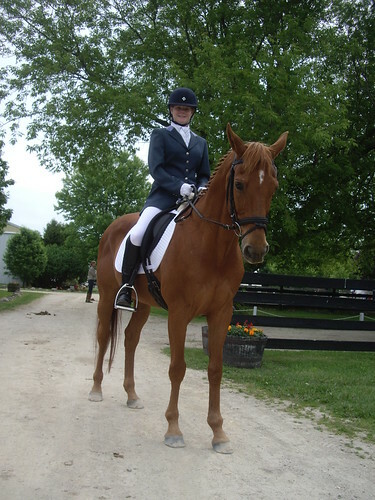 Christy believes that any horse can do dressage, and dressage will benefit almost any horse and rider combination. Her clients ride everything from warmbloods to Quarter Horses to paints to just-off-the-track Thoroughbreds. We’re all having fun and learning a lot. Importantly, we’re all progressing as riders and improving as horsemen. Christy has been patiently bringing her own OTTBs up the levels. She blogs about her horses on the popular TBatX blog. My retired horse Jag is boarded at Wyngate Equestrian in southern Wisconsin. The location is convenient to Woodstock, Illinois, and I visit him weekly. 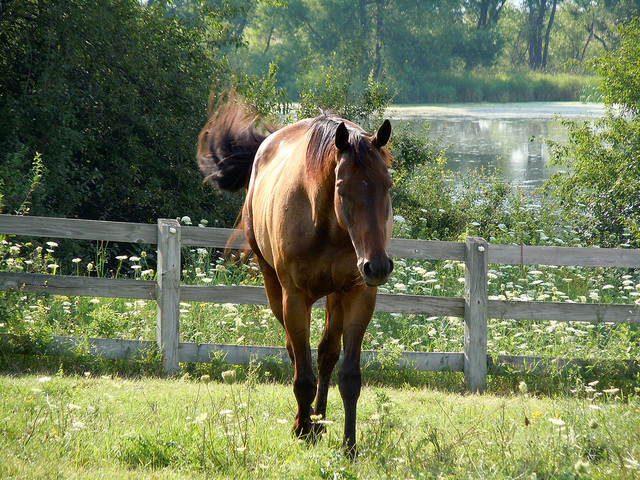 Wyngate Equestrian is a top-notch breeding, boarding and training facility, with a spectacular indoor arena, as well as a generous outdoor arena and adjacent trails. A variety of jumper and dressage trainers teach at Wyngate, and the barn also hosted a Robert Dover clinic in the fall of 2011. Sara Krause, who runs Wyngate and breeds premium KWPN jumpers under the Krause Sporthorses banner, also offers retirement board. Jag has had his dream year, enjoying endless hours out on green pastures. The level of care and attention to detail is excellent.